Munich mathematician Eva Viehmann will receive the 2012 von Kaven Award in mathematics in recognition of her outstanding research in the field of arithmetic algebraic geometry. The prize, worth 10,000 euros, will be awarded by the DFG for theseventhtime and presented at a ceremony during the opening of the annual conference of the German Association of Mathematicians (DMV) in Saarbrücken on 17 September 2012. The research conducted by this year’s von Kaven Award winner centres on the Langlands program, which consists of a wide-ranging series of conjectures that relate algebraic number theory to representation theory of algebraic groups. The program, which was proposed by Canadian mathematician Robert Langlands in the late 1960s, has developed into an important and highly relevant field of mathematical research, having resulted in several widely recognised applications in the field of number theory; examples include proof of Fermat’s Last Theorem by Andrew Wiles and Richard Taylor. Through her investigations into the global structure of moduli spaces of p-divisible groups and into the definition of local G-shtukas, Viehmann has contributed new and original findings in this specialised area. Eva Viehmann studied at the University of Bonn. It was there that she was honoured by the Faculty of Mathematics and Natural Sciences with the Felix Hausdorff Memorial Award for the 2004-2005 academic year, in recognition of her doctoral thesis “On affine Deligne-Lusztig varieties for GL_n”. Following postdoctoral research stays in Paris, Chicago and Taipei and after qualifying as a university lecturer in mathematics in 2010, during 2011-2012 Eva Viehmann was a DFG Heisenberg fellow. 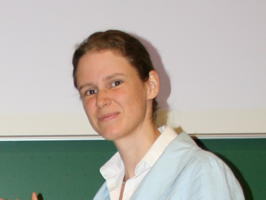 In July 2011 she was named an individual project leader in the DFG-funded CRC/Transregio “Periods, Moduli Spaces and Arithmetic of Algebraic Varieties”, and in April 2012 she was appointed professor of algebra at the Technical University of Munich. Her working group is being set up through funding granted to the project “Moduli spaces of local G-shtukas” as part of a starting grant received from the European Research Council (ERC). Eva Viehmann is a member of the Young Academy at the Berlin-Brandenburg Academy of Sciences and Humanities and of the German National Academy of Sciences – Leopoldina. Again in 2012, the DMV annual conference serves as the venue for presenting the von Kaven Award. The conference provides mathematicians an opportunity to share and exchange ideas on their field and is open to the general public. Günter M. Ziegler, professor at the Free University of Berlin and recipient of the Communicator Award and the Gottfried Wilhelm Leibniz Prize, will address the topic „Das ist doch keine Kunst! Zehn Bilder aus der Mathematik“ in a public lecture on 17 September. The presentation will focus on paintings by famous artists, artistic images by well-known mathematicians, equations and errors, depictions of mathematics and what it is capable of, artefacts, works of art, museum art, and much more. The prize money for the von Kaven Award is provided by the foundation of the same name, which is managed by the DFG and was originally established by Detmold mathematician Herbert von Kaven in 2004. Von Kaven died in 2009 at the age of 101. His interests even at a very advanced age focused on the principles of mathematics, and his entire life was dedicated to promoting research in the field.